Do Opposites Really Attract Or Do I Just Have OCD? I think it was the late, great Paula Abdul that said when it comes to relationships that “opposites attract”. It was certainly true in her case as she appeared to be dating another species entirely. Looking at the way I do things then at the way Greg does things I want to know if it’s just a case of the “opposites” in us both “attracting” or is it, to quote Greg, that I am “on the spectrum“? I hate having the television on first thing in the morning and I always like to put the radio on instead. Greg puts the news on the television. Greg watches intelligent documentaries about wars, Nazis and aeroplanes. If it’s not got a time machine, singing or a judging panel then I’m not interested. If I’m not in a room the lights are off and the doors are closed. Greg prefers Blackpool illuminations and open plan living. I always know where my keys, wallet and phone are as I keep them in the same place. We spend 10 minutes every morning hunting all the house for Greg’s. I would rather be an hour early for something than be a minute late. Greg waits until the last-minute to get himself prepared and wonders why he always ends up running about like Mr Bean and why we’re always late. If I use something I put it back in exactly the same place when I am finished with it. Greg likes to create new places to store things such as the floor, the worktop, the couch or the table. Before I go to bed at night I like to tidy the cushions on the couch so everything looks untouched in the morning. Greg prefers to see the “lived in” look at all times. I don’t like to be too hot and tell Greg to put a jumper on if he gets cold. 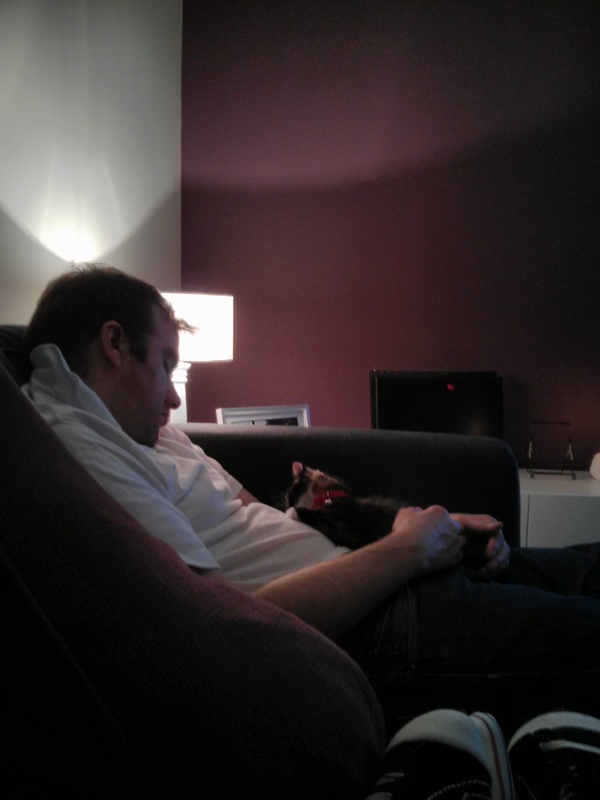 Greg will crank the central heating up to maximum so that me and the cats pass out on the sofa. I clean up. Greg makes a mess. I can’t be arsed rinsing out bottles, cleaning jars and scraping food into a different bin. Greg recycles. I like going out for walks. Greg doesn’t see the point in walking without having a dog. I like blogging and Eurovision. Greg’s banned me from talking to him about either of these topics! I’m quite sure there is more but I’ll leave it there for now. As I am a fair person I just went into the living room and offered Greg the chance to have his say by asking him to compile his “version” of the list. His response was “If it’s for a stupid blog post then I’m not doing it” as he then proceeded to exit the room saying he was going for a dump whilst leaving a Nazi program blaring on the television, shoes on the floor, the light on and the door wide open. Well…I tried! I would say from the above list, its looks like opposites does attract, even if as you say it is OCD, you have it and Greg doesn’t (or atleast the proportions vary) So there, opposites attract.